This is another post in the series catching up on 2012 projects! 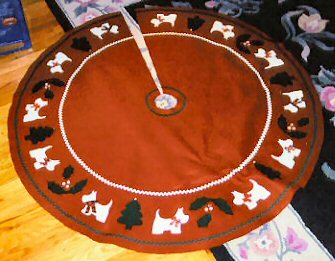 I don't remember the original fiber inspiration for this felt tree skirt, made sometime around 1998 when Wyndi, our first Westie girl, was still with us. I also can't remember which came first, the Westie Christmas tree or the tree skirt! The pattern for the little white terriers is from a Scottie Shortbread recipe in a Leisure Arts pamphlet and the holly and tree shapes came from one of the 1990's Leisure Arts magazines that showed them as fused appliques on sweatshirts. This tree skirt was an almost no-sew project: I glued the felt Westies, bought pre-made ribbons from a craft store and glued them onto each terrier, glued buttons and rick rack and only hand sewed the small jingle bells on the trees. The edges were all trimmed with pinking shears. Late last summer, a Facebook friend happened to find the online photo of my Westie Christmas tree skirt and asked if I could be persuaded to make one for her. I agreed, but put off working on it until after the Adorno Country Fair in October. I was juggling a few other projects in late October and had gathered all the supplies for the tree skirt, planning to work on it just before Halloween. And then Hurricane Sandy happened and left us without power for 5 days. Luckily, we didn't have any major damage, and as soon as we were back to normal with power and household needs, I got to work on the Christmas tree skirt. I didn't think to take photos along the way, so I can only describe in words how to make this tree skirt. The photos shown below were all taken after the skirt was complete and if the colors in some of them look weird it's because red gives me fits when I try to photograph it! I used premium craft felt for the skirt and all the shapes. Step 1: Using a disappearing ink pen, I traced circles for cutting the outer edges, center hole and placement of the rick rack. To create the circles, I made an impromptu compass by sticking a thumb tack through an old measuring tape into the center of the felt (with a scrap piece of mat board underneath to hold the tack and protect my table). Then slipped the tip of the pen through the eyelet hole at the end of the measuring tape to trace the circles. Step 2: I glued the rick rack along the marked lines with Aleene's glue and let it dry completely. Step 3: While the glue dried, I cut the felt applique shapes. The black and white terriers were cut out by hand. I scanned and printed several copies of the pattern on paper first, then sprayed the back of each paper pattern with temporary adhesive spray to keep it steady on the felt while cutting with scissors. I decided to machine embroider the holly and tree applique shapes, so these were made by stitching the dielines from the embroidery designs onto felt and cutting them out with scissors. The embroidery designs I used are from Embroidery Library's Christmas Heirloom Applique pack. Step 4: The felt applique pieces were arranged around the felt skirt until I was pleased with the design, then I marked the placement for each with either pins, disappearing ink or chalk marker. Step 5: Machine embroidered the Christmas trees and holly and berry embroidery designs. I hooped medium weight tearaway stabilizer and used temporary adhesive spray and a few pins to keep the felt skirt on the hoop, then embroidered with rayon embroidery thread. Step 6: Using the sewing machine and a blanket stitch, I appliqued the terriers in matching rayon embroidery thread in the needle and regular sewing thread in the bobbin. Step 9: For the final finishing step, I cut around the edge with a scalloped rotary cutter to give it a nice wavy edge. I like the way it repeats the look of the rick rack.